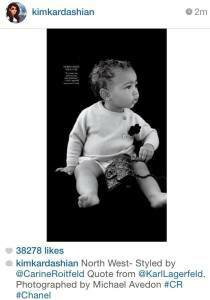 North West- 1 YEAR OLD MODEL! She’s only one and Kim Kardashian & Kanye West’s daughter North is already a model! She’s in the fall issue of CR Fashion Book dressed in Chanel-purse & all! Say what you want about her parents, she is one CUTE BABY!